Frei: Is Duncan Siemens becoming more than an “organization” guy? Although the nameplate said SIEMENS, it’s still Erik Johnson’s choice stall, temporarily reassigned. Johnson is out with what now is believed to be a separated shoulder, and he isn’t coming back soon. 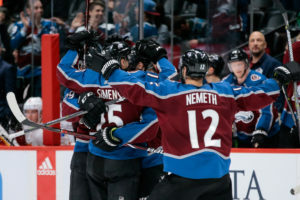 Siemens, the Avalanche’s second of two first-round draft choices in 2011 who was playing only his 10th NHL game Wednesday night, was called up from the San Antonio Rampage last week. He’s getting another look in the wake of the defensive corps injuries to not just Johnson, but also Mark Barberio and (more short-term) Anton Lindholm. One of the more interesting moments in the Avalanche’s potentially crucial win came when Siemens, cotton stuffed in what likely was a broken nose suffered in a first-period fight with the Flames’ Tanner Glass, shot the puck from the Colorado zone into the empty Flames net with 17 seconds remaining. It wasn’t a work of art. It also was his first NHL goal. When the puck went in, his teammates giddily celebrated, on the bench, and on the ice — as if it was a big deal. Genuine wide smiles. Arms raised. A more-emphatic-than-usual group embrace around the empty net goal-scorer. It was a big deal because of who it was. It was more specific than that, though. This was a long time coming, and his Avalanche teammates knew it. They also know that Siemens is a popular AHL journeyman with the Avalanche affiliates at Lake Erie and then San Antonio who hasn’t been able to crack and stick on the Colorado roster, despite going 11th overall in the draft seven years ago. But Siemens hasn’t groused, has remained with the organization and become considered the type of leader you want around your prospects. Before this season, his stints with the Avalanche were limited to one game in 2014-15 and three last season. No question, the 11th overall pick in the NHL draft — the Avalanche also had the second overall choice that year and took Gabe Landeskog there — is supposed to be better than that. 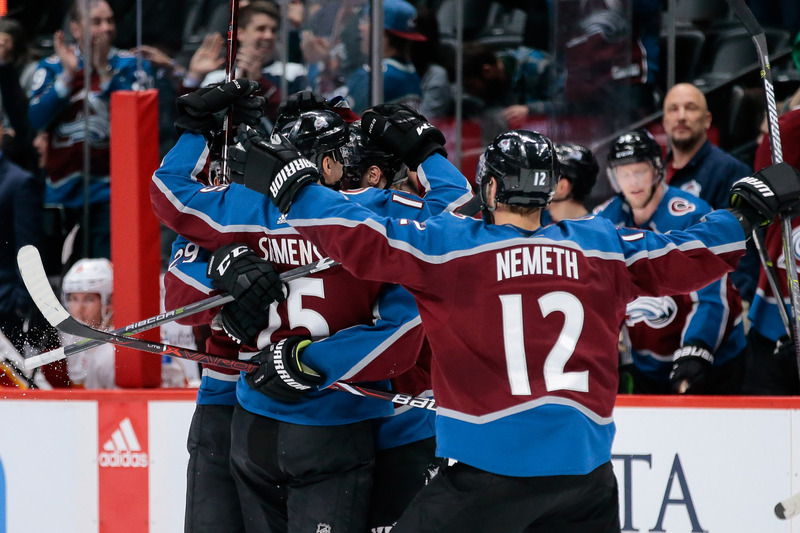 Siemens’ lack of success was at the leading edge of any discussion of the Avalanche’s inability to draft and develop elite defensemen as one of the problems that led to the slide after the 112-point season under Patrick Roy in 2013-14. But it was hard to hold that against Siemens — because he was such a pro. Can he ever be more than that organization guy? The odds remain against it, but he had another solid game — his sixth game of the season and fifth since his most recent call-up — again Wednesday night against the Flames, logging 13:25 of ice time. He mostly was paired with fellow callup and AHL veteran David Warsofsky, but he was with Nikita Zadorov late. This is at least showing that Siemens can be called up in times of injury and step in. I asked Siemens if he ever had accepted being an “organization” player. If nothing else, this stint might additionally establish Siemens as a higher-priority potential callup in times of injuries, and when the Avalanche AHL affiliate becomes the Loveland-based Colorado Eagles next season, the callup potentially can be by car if both teams are home. 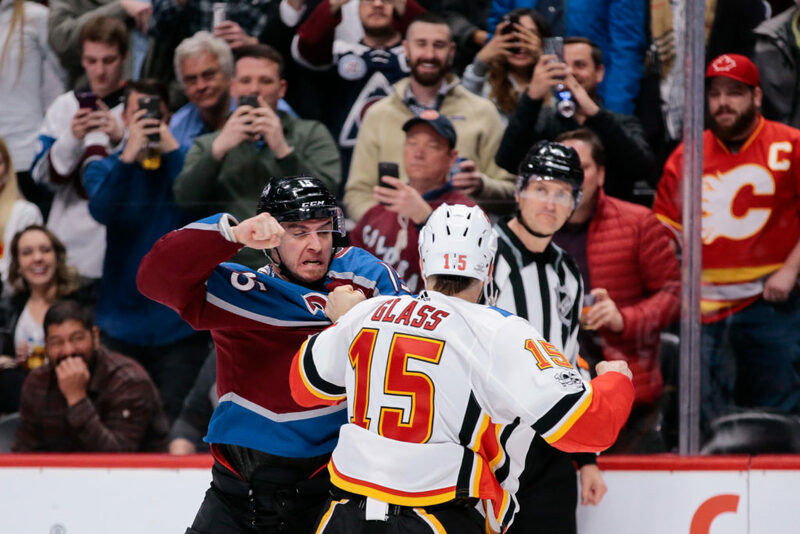 With the Avalanche having the offensive-minded and undersized Tyson Barrie and Samuel Girard among its top six, physicality among the other D-men becomes more important. Lindholm has an edge, but at 5-11 and 191, he’s not a freight train, either. The vibes from San Antonio also seem to be that all connected to the Rampage are rooting for Siemens — and rooting for him not to come back. Avalanche coach Jared Bednar worked with and saw many “organization” guys during his coaching stay in the AHL. “I certainly like the way he’s playing,” Bednar said of Siemens. “I was new to the organization last year and we came in and I haven’t seen the way he’s played in the past. So he kind of gets a fresh set of eyes, a fresh set of coaching staff eyes on him last year again, and again this year with some new staff members. We liked what he did for us at the end of last season. We liked what he did for us in training camp and through part of exhibition. He had a couple of rough exhibition games, we thought, and this is his second callup this year and we’ve liked what we’ve seen.